Today has been one of those days that's just crummy. Not one where it's bad and I can look to turn it around. One where I can't catch a break, can't seem to do ANYTHING right, one where I feel like an utter failure. One where I'm not sure just how everything went so awful so instantaneously. One where I just can't. seem. to. fix. anything. I broke my tooth, need a root canal, and after some major crying (which I SO don't do in public...but did a TON of last night), they put me on Perkoset -- which makes me tired, dizzy, and really emotional. For someone who prides herself on her pain threshold, this stuff hurts like hades. But beyond that my heart hurts. I'm confused, and hurt, and just plain lonely. I'm homesick, I'm sad, and I just want my momma to snuggle me and tell me everything is going to be okay -- because when she says it, I believe it more. I want my best friends. I don't want/need/expect your pity. I just wanna get over my own. I want something to go right, feel right, be right again. I want to understand the thinking behind the action, why this place isn't the same as all the others, why--for the life of me--I can't stop thinking about May 25th in a hopeful and OH SO necessary kind of way. Well, I'm gonna go pass out. 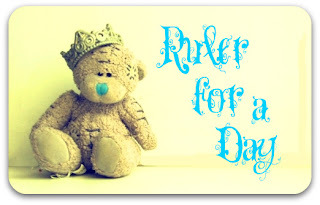 BUT in a non melancholy way ... be sure to check out my Ruler for a Day post and give me all the reasons why YOU ROCK. Aw, sweetness... i'm sorry. I wish I could hug you and tell you everything is going to be okay... I have a VERY convincing Mom voice, I promise! & It will be okay, I promise. Tomorrow is a new day, treat it as such. I heart you, lady! Oh gosh Siovhan.... I've been there! I broke my tooth TWICE before I finally went to the dentist and found out I needed a root canal. And then I proceeded to cry at the coffeeshop. Not one of my shining moments. But it'll get better! It totally will. Big hugs to you hon. I know exactly how you feel when you talk about missing home and just wanting your mom. I don't think that will ever change. You're lovely. Things will work out. Oh, days like this come around every once and a while, and they like to pop up when you really don't want them. Hang in there! Feel better. And know that I think you're much braver than I am for moving away from home. Because I could, never ever do it! Awww, did you disallow comments on your newest post ? Cuz I can't figure out how to comment on it .. and I wanted to tell you how cute that was. You're really to have such a person in your life .. and I'm glad this guy is acknowledging in every way possible that YOU are AWESOME and worth all of that !! New follower, loving the blog! I'm so sorry that your heart is hurting. I remember missing my Mom so much when I lived away. Hang in there!